Suri Cruise pictured arriving home after school in NYC on Tuesday, November 25th 2013. 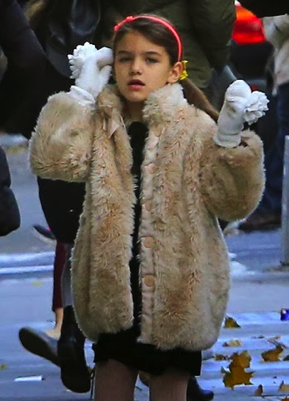 Suri was wearing White Flower Fleece Mittens FW13 by GAP. outfit info: Pink Puffer Coat FW'12 by Monnalisa (first seen on October 21st 2012) and shoes by Puma. 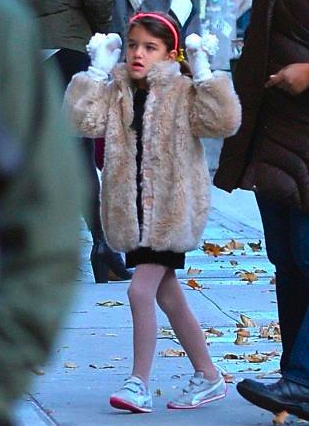 Suri Cruise spotted with a younger friend in NYC on Saturday, November 23rd 2013. 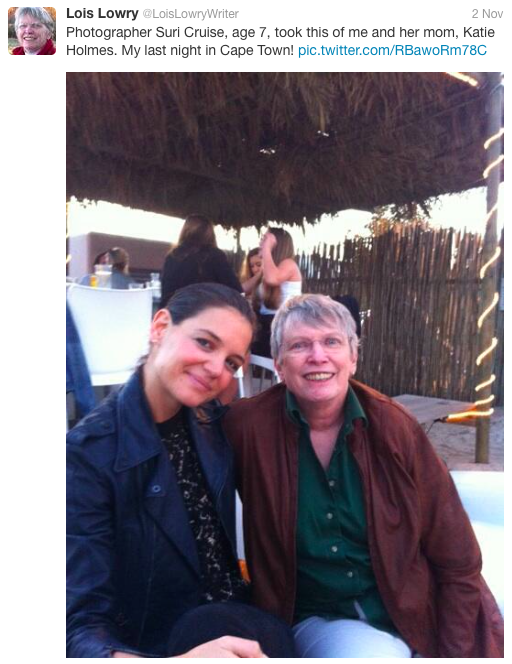 Suri was wearing Royal Blue Dress FW13 by Missoni and Embroidered Denim Jacket from Isabel Marant for H&M collection. Suri was wearing Dark Pink Calia Flats Shoes FW13 by Peek. 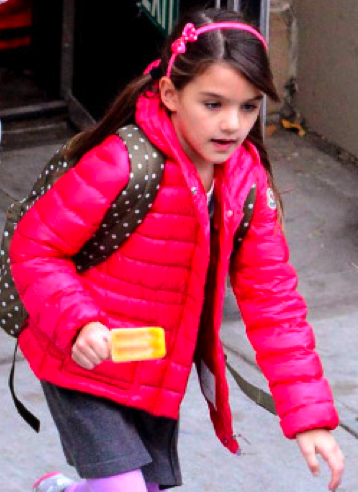 Suri Cruise enjoyed her after school ice-scream treat on Friday, November 22nd 2013.
outfit info: Lauriane Pink Jacket SS13 by Moncler (first worn on August 27th 2013). Suri Cruise pictured exiting The Avenues School in NYC on Thursday, November 21st 2013.
outfit info: Oso Pink Hoodie by The North Face, Dress by Crewcuts and Shoes by Puma (spotted yesterday). 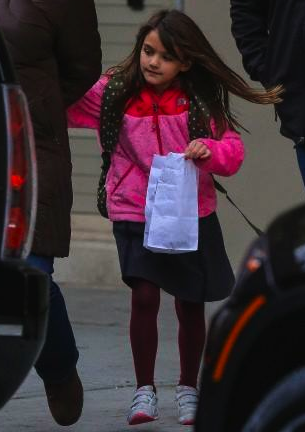 Suri Cruise pictured arriving to school in NYC on Wednesday, November 20th 2013. Suri was wearing a new pair of Steeple Glitz CYG Silver/White Kids Shoes by Puma. outfit info: Lime Faux Fur Jacket from All For Children UNICEF FW12 collection by H&M (first seen on January 21th 2012) and Black Velvet Dress FW13 by Lanvin (first seen on September 18th 2013). Suri Cruise looked warm & cozy in Katie's sweater while leaving school in NYC on Tuesday, November 19th 2013. Suri Cruise was wearing Maud Black Crepe Dress FW'12 by Bonpoint (first seen on March 5th 2013). 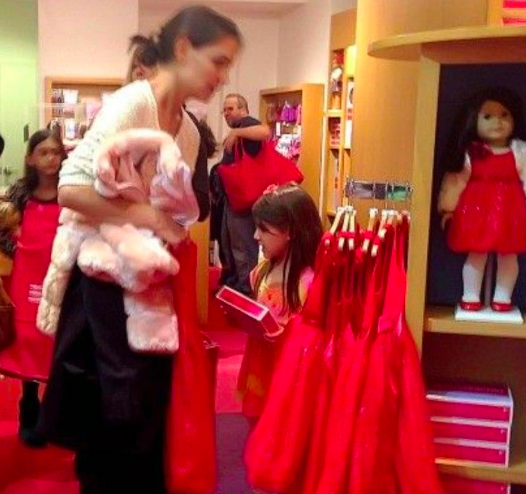 Suri Cruise spotted out in NYC on Monday afternoon, November 18th 2013.
inside the American Girl store photo of S&K shopping! 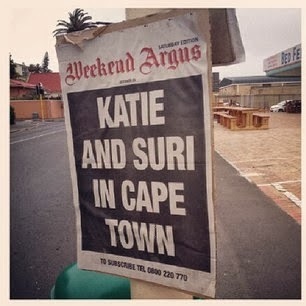 November 2013: Suri is Back in NYC! Suri Cruise is back to her usual schedule and seen arriving to The Avenues School in NYC on Monday, November 18th. 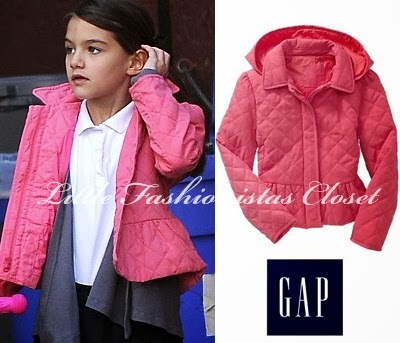 Suri was wearing Pink Quilted Peplum Uniform Jacket by GAP (first seen on October 8th 2013), Pleated Hem Black Uniform Jumper by French Toast. 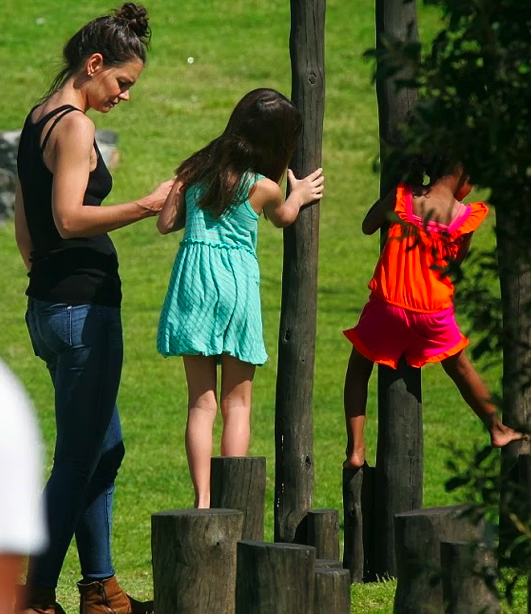 Suri Cruise had fun at The Greenpoint Urban Park in Cape Town, South Africa on November 9th 2013. Suri was wearing Nutmeg Stripe Bubble Dress SS12 by Spledid Littles, (first seen in August 2012) and Hello Kitty Flip Flops by Ipanema. Suri Cruise goes sightseeing to the Table Mountain near Cape Twon, South Africa on November 8th 2013. 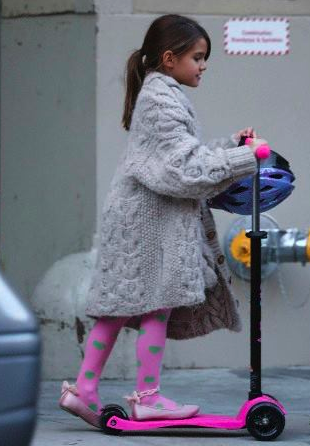 Suri was wearing an oversized cream sweater and Hello Kitty Crocs, (first seen on June 8th 2013). Suri Cruise had a day of fun at the Two Ocean Aquarium in Cape Town, South Africa on November 7th 2013. 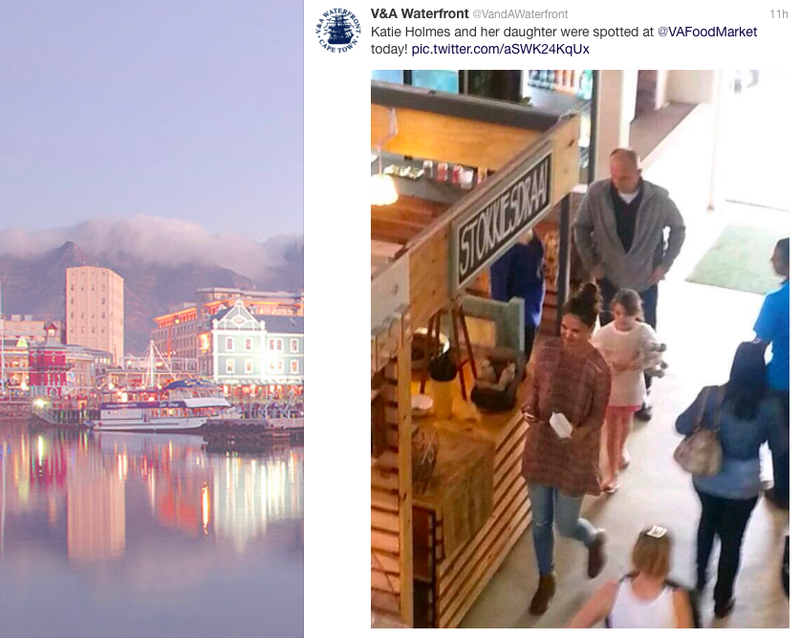 Suri & Katie were spotted at V&A Waterfront food market. 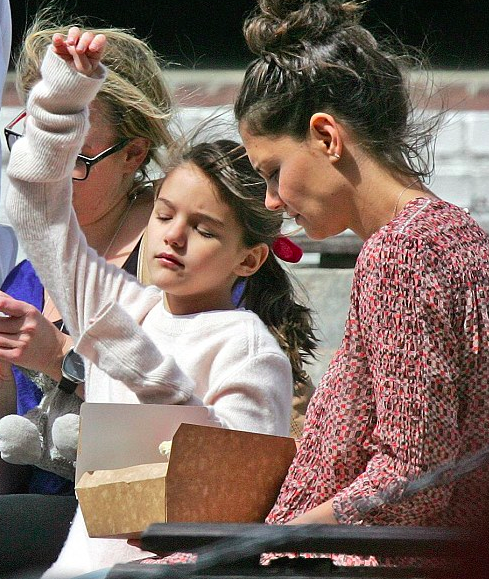 Suri was wearing an oversized cream sweater and Pink Bow Ponytail Holder by American Girl. 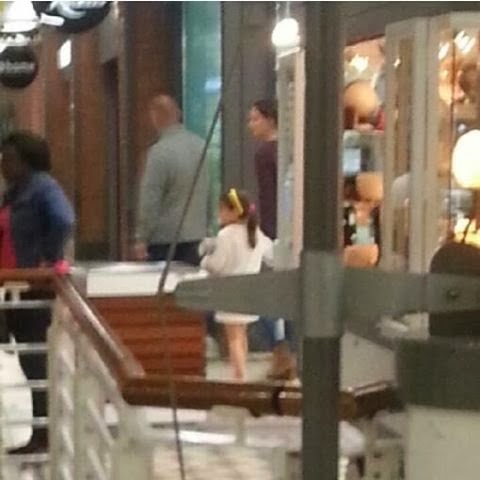 Suri Cruise was spotted shopping at V&A Waterfront shopping mall in Cape Town, South Africa on November 5th 2013.